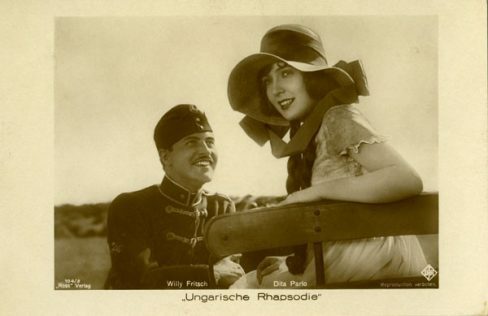 Hungarian Rhapsody (Ungarische Rhapsodie) is a 1928 German silent drama film directed by Hanns Schwarz and starring Lil Dagover, Willy Fritsch and Dita Parlo. Shot at the Babelsberg Studios in Berlin and on location in Southern Hungary, it premiered at the Ufa-Palast am Zoo cinema in Berlin and was one of the most popular German films released that year. The film’s sets were designed by the art director Erich Kettelhut. Depicting the life of an impoverished Hungarian aristocrat, it is a charming comedy of romantic intrigue among members of the upper and lower classes which is set in 19th century Hungary. Franz, an impoverished army officer wants to marry Marika, the daughter of a foreman. Without money he is unable to, so he turns to the wiles of Camilla, The General’s bored wife. The General hears of the tryst and tries to catch the lovers together. The film will be shown from a BFI 35mm print with live accompaniment from John Sweeney, and will be presented by Michelle Facey.